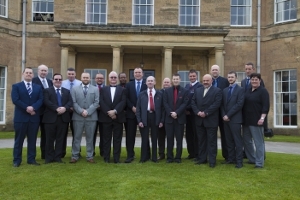 Dedicated Securitas officers have smashed last year’s company record by collecting fifteen regional titles at the British Security Industry Association (BSIA) Security Personnel Awards 2015. The awards recognise officers who exemplify extraordinary dedication, loyalty, teamwork, customer service skills, use of technology and bravery. One such officer is Adam Murphy, a mobile security officer from County Down. Adam was chosen as the winner in the Outstanding Act, Ireland, category for his bravery in the early morning hours of September 2014. While on duty and driving to his next site, Adam witnessed a violent crime happening in the street involving a deadly weapon. He instinctively drove his van between the two brawlers in order to separate them. After several exchanges of the weapon and its subsequent discarding, Adam and a member of the public exited their vehicles to assist the wounded man. The attacker escaped, however Adam gave chase managing to restrain the offender shortly afterwards. Leeds security officers Darren Pounder and Mark Clifton also scooped a well-deserved accolade for their courageous actions and swift handling of an incident at Leeds Bus Station when they were alerted to a young woman who was in the later stages of labour in the ladies toilets. Mark and Darren cornered off the area in order to give her the privacy she needed and Darren called the emergency services to request paramedics and an ambulance while Mark continued to protect the area to ensure that access to the toilets was restricted. Darren remained calm and offered support to the mother-to-be whilst taking instructions from the telephone operator as it was becoming apparent that medics would not arrive in time to oversee the birth. An ambulance arrived on site just as the woman began to give birth and paramedics took over the situation, successfully delivering the baby. These officers, along with the other Securitas regional winners, will now proceed to the national judging phase of the awards, which will culminate in a glittering awards ceremony held at the London Hilton on Park Lane on 15 July 2015.